I’m continuing my week of celebrating 800 posts on my blog by continuing to ramble about all things 40k right now, and thought it about time to get round to the big box expansion for Kill Team that came out in September: Rogue Trader! So as you probably know, this box was something pretty special. Named for the space privateers that plough the galaxy under the Emperor’s own Warrant of Trade in search of new planets to plunder for the Imperium, the name not only conjures up adventure and glamour but also hearkens back to the original, first edition of Warhammer 40,000. It was certainly something special that captured the minds of hobbyists all over the world, and while I was away on honeymoon when it actually came out, I wasted no time once I was back home in picking up a copy for myself and getting all of those miniatures built! While I did manage to get a lot of stuff built in a short space of time, I have only now started to paint up the Imperium half of this box (stay tuned for some progress shots of those models coming at the end of the week!) 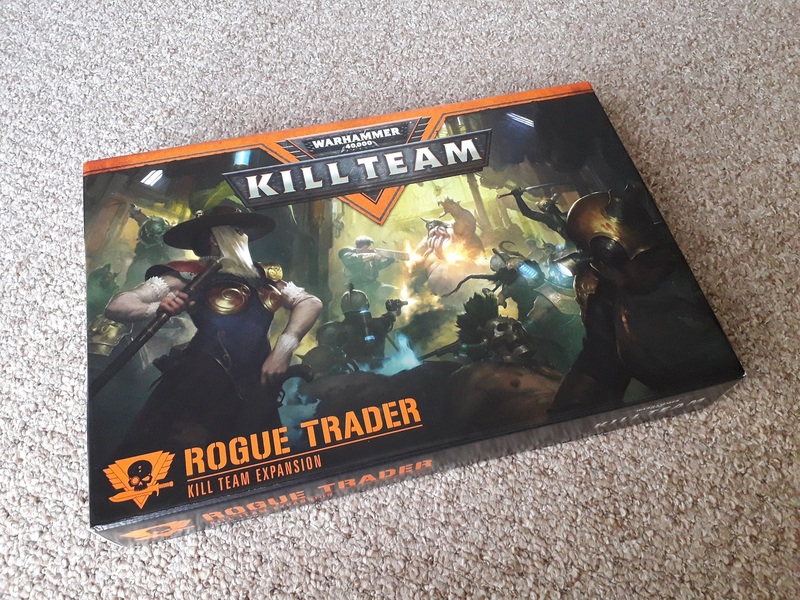 But I’ve been talking about the expansion (and Kill Team in general) a lot, so I think it’s about time I got round to taking a proper look inside the box here on the blog! The box is divided into the Elucidian Starstriders, led by the Rogue Trader Elucia Vhane, and the nasty Gellerpox Infected, a subsection of her crew who have been infected by the Gellerpox and now look even worse than some of the Nurgle gribblies. Not only do we have the rules and cards for using these miniatures within the Kill Team game, but GW have also kindly provided two mini-Codexes for each of the teams, so we can use them in regular 40k! I’ll be taking a look at those later in this post. For now, let’s talk about the Kill Teams themselves. The box comes with 33 miniatures, ten for the Starstriders and twenty-three mutants, as well as two frames of scenery comprising bulkhead doors and computer terminals. The game board features, on one side, the Rogue Trader shuttle Truehawk, and on the other a Ministorum shrine. The narrative booklet that is included features some background on both Rogue Traders and the gellerpox, and tells the story of the shuttle being overrun and crashing on the planet Arcadia Neos. There are enough missions included in the book to allow you to play through the storyline, as well as more generic mission types that allow you to use the maps and scenery included for one-off style events. New rules include fighting in close confines, a first look at the Commanders rules that later came out as a separate expansion, and the new Strength specialism that currently only applies to one model as far as I can tell, Vulgar the Thrice-Cursed. Finally, there are some advanced rules that let you combine Kill-Zones and link missions together to create a “Historical Campaign”. For a 56-page booklet, it crams a lot in!! The models are, as you’d expect, stunning. The Gellerpox Infected faction look disgusting in the tradition of Nurgle, but whether due to the fact that I was building them all up at the same time or if something else was at work, I really found these miniatures to be difficult on the eye when building them. I mean, they’re Nurgle-y, so it’s to be expected, but still. Something about them just put me off, so I can’t imagine I’ll be doing a great deal with these anytime soon! The entire warband comes to a total of 258 points in Kill Team, if you use all 23 models (193 points if you leave out the Commander). The Starstriders, however, have just got a delicate grace about them that really excites my imagination. They feature so many design references to the larger Imperium, and what makes 40k so incredibly interesting to me as a setting, that I can’t begin to say just how much I like them. There are three named characters within the Kill Team that each have a set specialism, but each of them does not count towards the total number of specialists that you have – an interesting point that I thought it worthwhile mentioning. The total team comes to 145 points (100 points exactly without the Commander). We only get ten of them – nine people, and a dog – which is such a shame, and has led to me really wanting to see more models in this style. When Blackstone Fortress was originally announced, I’d hoped we’d get a second Rogue Trader style crew that could potentially be combined with this to create a decent-sized force, but obviously now we know we’re only getting one Rogue Trader in that box, with the only other mini related to this style being the Navigator. It’s a shame, but the fact that GW have said they’re using these kinds of releases to explore hitherto unexplored corners of the setting does give me hope that we’ll be seeing more of them in the future. 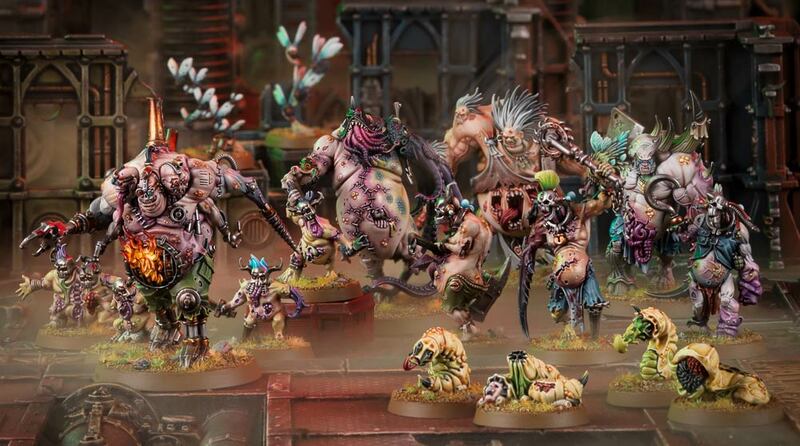 As it stands, I don’t even think I want them particularly for regular 40k – I just want them because they’re an amazing band of miniatures! But we can use them in regular 40k, thanks to the mini-dex, and that’s something I want to talk about now. The Gellerpox Infected are all Chaos, and have the Nurgle keyword that will allow you to ally them in with a bunch of regular Nurgle daemons for added disease and disgust. They form a patrol detachment that is built around Vulgar the Thrice-Cursed, which comes to a total of 238 points. As a complete detachment, they are set up en masse when Vulgar is set up, and not only does the Thrice-Cursed give you access to seven distinct Gellerpox Infected stratagems, he comes with a warlord trait that gives you +3 command points to use on those stratagems. There are only a couple of stand-out units in the Gellerpox Infected list, for me – the Eyestinger Swarms that allow you to keep adding slain models back to the unit at the start of every turn sounds annoying, but they’re probably more annoying than actually dangerous. The Glitchlings could similarly be annoying, as they subtract 1 from ranged attacks that target them, while the Hullbreakers, with S5 AP-2 weapons, could be quite the bothersome unit. If I were to take any of these in an army, I think it would be the Glitchlings and Hullbreakers, with the inevitable Vulgar tax to make it work. On the other hand, the Starstriders are a much more interesting force, for my money. Much like the Gellerpox, there are rules that allow you to set up the whole detachment at the same time as Elucia hits the table, and gain +3 Command Points for using Elucidian Starstrider stratagems (of which there are eight). The Rogue Traders have the Inquisition rule that allows them to use any Imperium transport vehicle, which is nice and fluffy. Elucia Vhane herself feels like a much more useful HQ unit than Vulgar, allowing friendly units within 6″ re-roll hit rolls of 1. She’s fairly decent in terms of BS/WS, though otherwise has generic human stats with 4 wounds. The Voidsmen are generic soldiers, though the heavy rotor cannon is a nice addition. The Lectro-Maester, Larsen van der Grauss, provides a nice buff to the force, giving everyone a 5++ who is within 6″. He also has a unique stratagem that allows him to better hold objectives. There’s also a healer, and the Death Cult Assassin for some added meat, both of whom also get their own unique stratagems. All of this comes in at 145 points. It’s definitely a smaller force, but it feels a lot more tight-knit than the Gellerpox, and I can see it working fairly well within a larger Imperium army. Unfortunately, there is a real mix of keywords here, meaning that you can only slot them into an existing army within their own detachment. 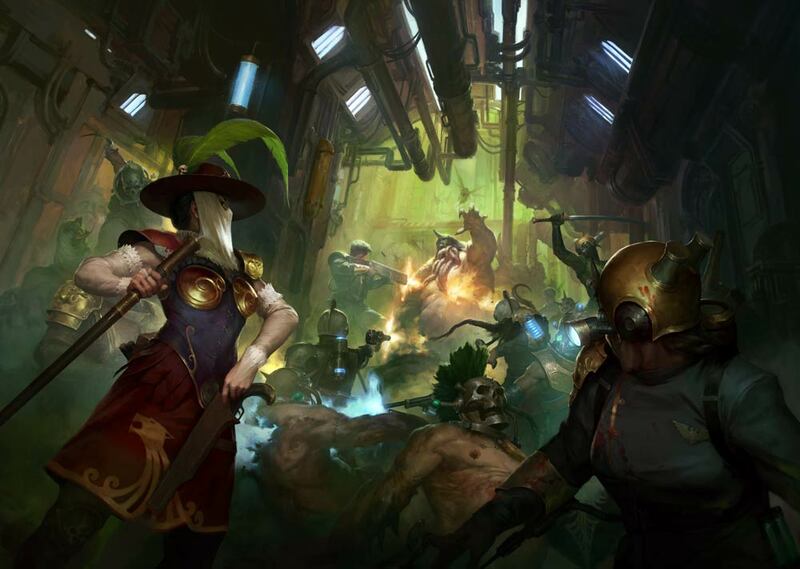 Larsen van der Grauss will also fit within the Adeptus Mechanicus as a Tech-Priest, while Knosso Prond will fit into a Ministorum faction list as an additional Assassin should you feel the need. What’s even more disheartening, the new models from Blackstone Fortress won’t really slot in here, either – Janus Draik is basically Elucia Vhane with different grenades (and his multi-spectral auspicator only works on himself) but he could fill in as a second HQ if you wanted (you can’t use this to create a Rogue Trader battalion, sadly, as the only troops on offer – Nitsch’s Squad – have a limit of one-per-army) while Espern Locarno the Navigator, who would fit in the army on theme with no problem, has no keywords in common besides Imperium, so he’d currently have to sit in his own detachment. If you wanted to add in these two, though, it would only be an additional 70 points, so still not bringing it up to the realms of the Gellerpox! 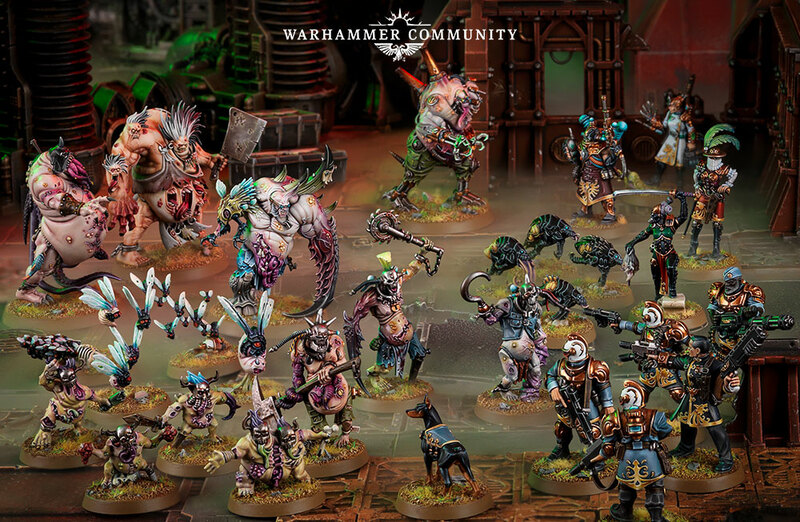 I am incredibly guilty of demanding more of these miniatures to create an army for 40k – both here and with Blackstone Fortress – while almost overlooking the fact that this box has got so much to commend it. Kill Team has felt to me recently like it was getting bloated, with all the Commanders stuff that has been released lately – but I failed to see past the initial fact that yes, there may well be 108 individual products on the webstore for Kill Team right now, but all of these are merely adding in options to the game, and it really is something of a toolbox for you, to do with as you will. I think this is a valid point that I need to learn – new GW isn’t always using board games to stealth-release new models into the tabletop game. 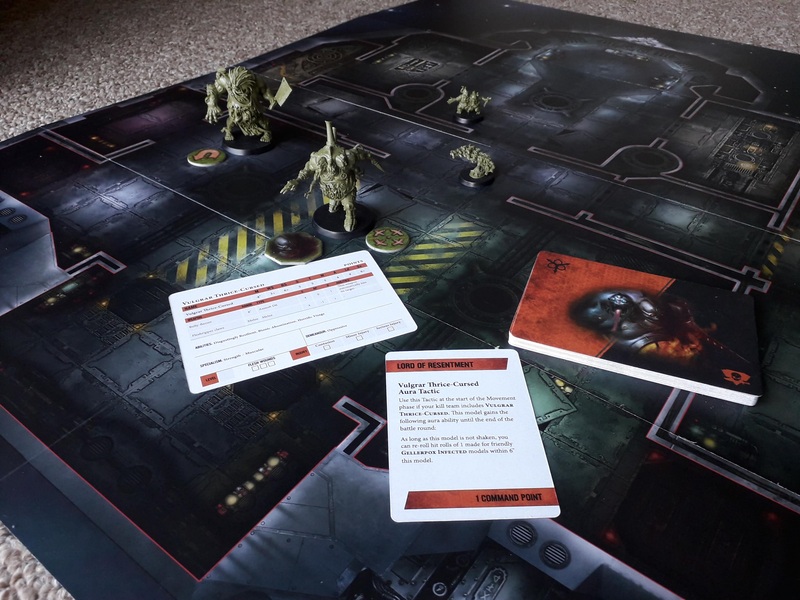 Even things like Deathwatch Overkill were decent enough as regular board games, they just get a bit overshadowed by the fact they herald a new range of miniatures. While there have been a lot of releases for Kill Team that repackage existing miniatures and have led to something of a flooding in the market for content, I think it’s important to note that, to date, Kill Team as a game has only got two actual expansions in the traditional, board game sense: Rogue Trader, and Commanders. The army expansions are more like additional bits, nice-to-haves that aren’t really required to play the game (certainly not if you’re only using the starter box armies). The environment expansions are maybe more in the vein of a traditional expansion, although again, they only offer variations on the core theme. When you look at the line more as a traditional board game, I think it feels a lot more contained and, actually, quite a fun experience. Rogue Trader adds to that experience by bringing with it two extremely thematic teams that make use of the Commanders rules while providing additional content for the close-quarters fighting. I believe that Commanders was supposed to be released first, but somehow the image of Rogue Traders fighting Gellerpox Infected was leaked too soon, forcing a switch-up of the release schedule. Ignoring the fact that there are rules for Necrons and Deathwatch and goodness knows who else to play in this game, if you just bought the core set, the Commanders expansion, and this, you’d have a really thematic set that would provide a whole lot of fun and enjoyable gaming for a long time. The modular expansion model of new armies with their own tactics and terrain to fight over, and the Kill Zone expansions that change up the battlefield, these are all really nice to have, but I think it helps tremendously to see these as very much ancillary to the main product. If you think of it as a board game line that just happens to use existing GW products, it helps a lot! Don’t forget to come back later in the week to see how I’ve been getting on painting up the Elucidian Starstriders! I’m posting every day this week to celebrate 800 posts, so come back soon! Pingback: Nobody expects the Inquisition! Pingback: Model of the Year! Pingback: New Year Open Day 2019!